All historical films are bound to have inaccuracies. However, contextually and broadly, the film portrays many truisms. Scorsese does a fine job in accurately portraying life in the Five Points. Him and his staff paid close attention to costumes, set design, accents and slang leaving the audience to fell as if they were in the Five Points. 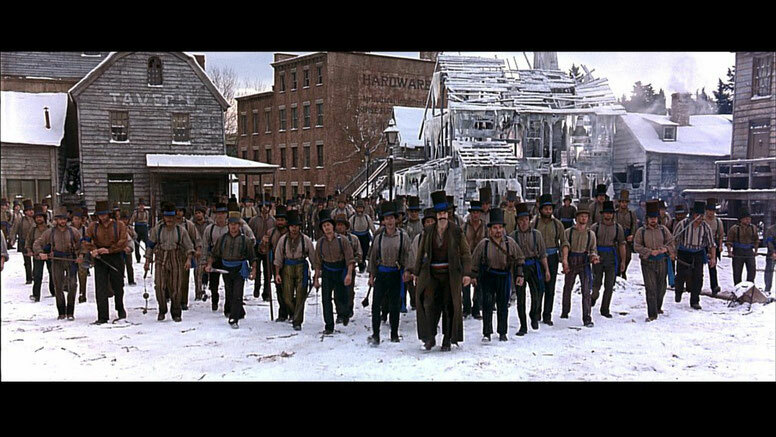 The Five Points was notorious for Irish and Nativist street gangs. There was also strife amongst the Irish, the Blacks, the Catholics, and the Protestants. And the film does portray the draft riot in response to the 1863 Conscription Act with a high degree of historical accuracy. However, when deconstructed, there are places that are almost pure fiction. The film does gain some inspiration and some history from Herbert Asbury’s Gangs of New York. Asbury, was newspaperman who wrote salacious tales about the New York underworld and was known for recycling long held urban myths rather than actual fact. While the Five Points was a violent city, the film seems to exaggerate this point with overly bloody battle scenes and explosions. Professor Tyler Anbinder author of The Five Points said, that the neighborhood was less dangerous, less violent and more productive than it’s image said and much of the violence and murder was overstated. Many of the immigrants in real life were seamstresses and skilled workers, such as tailors, shoemakers, and day laborers. With that being said, there are three main issues that I am focusing on that drastically impact the big picture. All three of the protagonists, the Priest, Amsterdam, and Jenny are also fictionalized. While there was some Irish- American gang leaders that could have been the heroes of our film, Scorsese chose to make up these characters instead. This could have been done to fit a broader picture and to symbolize facets of Irish Americans of the time. He could have made this choice because fictional characters were more interesting than real people and made for a more exciting story. Either way, we come away from the film with a martyr, a hero, and a love interest that never existed. The fictional depiction made for a great story but was not historically accurate. The Gangs of New York also shows a lot of interaction with Asians, specifically the Chinese. This depiction is quite inaccurate. In a review of the film done by J. Matthew Gallman, “we see more Chinese characters in the film then there probably were in the entire state”. Ah Ken is claimed to be the first Chinese individual to have arrived in the fringe of the Five Points in the 1840’s. He is the first Chinese person credited as having permanently immigrated to “Chinatown”. Chinatown started on Mott, Park, Pell, and Doyers Streets, just east of the Five Points district. By 1870, there was a Chinese population of a little over 200. The Sparrow Pagoda and the amount of Chinese interaction is not accurate and can most likely be attributed to the time this film was made. Martin Scorsese says as much. Sparrow’s Chinese Pagoda was a saloon in the 1880’s. 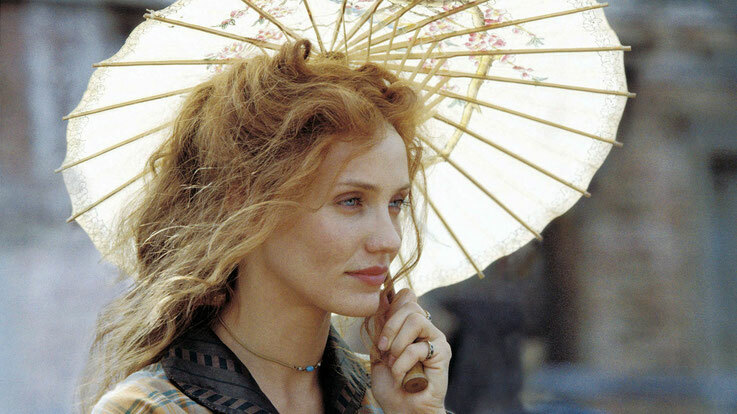 And Scorsese also said the depiction of the pagoda was fantasy and based on The Shanghai Gesture a Boris Leven film. Another instance that is not historically accurate are the “catacombs” at the Old Brewery. The “catacombs” in the Old Brewery are a virtual impossibility due to the ground they were built on. According to Ashbury, the Old Brewery held over 1,000 men, women and children, though this fact, like many others, is most likely distorted. The Five Points was built on what the Dutch called the Collect Pond. In the 18th century, the pond was used as a picnic area during summer and a skating rink during the winter. It was the areas fresh water supply as well. However, industries began to use the water and dump waste there. These included tanneries, breweries, ropewalks, and slaughterhouses. By the late 18th century, the pond was already considered a common sewer. It was summarily filled in from land and refuge removed from nearby Bayard’s Mount, and leveled between 1803 and 1811. So it is highly unlikely than an area that was a pond in a short period of time could be dug as catacombs. The Gangs of New York historical background is greatly entrenched within the history and climate of the Five Points neighborhood of the time. It was given the name of the Five Points because of the intersection of Mulberry Street, Orange Street (now Baxter), Cross Street (now Mosco), Worth Street and Little Water Street to create the plot of land known as Paradise Square. 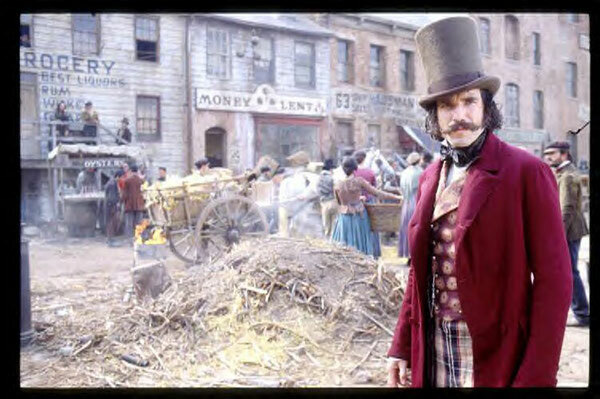 One of the great Gangs of New York quotes from Bill The Butcher is when he explains the intersection of the Five Points to William Tweed, "Mulberry Street... and Worth... Cross and Orange... and Little Water. Each of the Five Points is a finger. When I close my hand it becomes a fist. And, if I wish, I can turn it against you. "The Five Points area was built on what was known as the Collect Pond. The pond was a main source of fresh drinking water for the city. As a result, business erected along the shores of the pond and contaminated it in a short period of time.The pollution became a problem and a hazard. It was proposed to be cleaned and used as a centerpiece or a recreational park, but that proposal was rejected. Instead, it was decided to fill in the pond, and the landfill was done poorly. Buried vegetation began to release methane gas, which is a natural by-product of decomposition. The area also lacked adequate storm sewers. Because of the poorly filled in land, houses and buildings shifted on their foundations. The place was infested with mosquito due to the poor drainage. In essence, it stunk and the place was filled with disease. Nobody wanted to live there except the poorest of the poor. When the Irish began immigrating to the city in large droves largely due to the Great Irish famine of 1845–1852, Irish immigrants began piling into the Five Points and making the neighborhood their new home. It's hard to imagine anti-Irish sentiments in America today. They've assimilated deep into American culture, and it seems like I'm always meeting someone who has Irish blood and ancestry. Concerning the real history of the Gangs of New York, the movie genuinely captured the hatred and distrust towards the Irish by Americans or Natives of the time.Newspapers of time demonized Irish immigrants and often depicted them in cartoon drawings as slovenly, drunk and hostile creatures with no morality or decency. They were received by most of America as an unwanted threat to the country. In a scene in Gangs of New York where both William Tweed and Bill "The Butcher" Cutting are at the docks watching newly Irish immigrants walk off the ship onto American soil, Tweed makes a remark about new Americans being born. Bill The Butcher retorts, "I don't see no Americans. I see trespassers - Irish harps who would do a job for a nickel what a n*gg*r does for a dime and what a white man use to get a quarter for." That quote in Gangs of New York was absolutely genuine to how Americans saw Irish immigrants as a threat to stealing jobs from Americans. Many Irish were willing to work for less than the free black labor force during the time. It should be noted that there were many resentments from the Irish towards the blacks during the time as well. Near the beginning of Gangs of New York, Bill Cutting and his Natives are walking down the street while protesters hold up signs that read New York Succeed From The Union and Lincoln Will Make All White Men Slaves while Union Troops parade by. In this scene, Bill The Butcher snidely remarks to the Union soldiers, "That's the spirit boys, go off and die for your blackie friends." The two Gangs of New York quotes used was to illustrate the economic threat that Americans perceived with the Irish, but also to depict how the Irish were also seen by Americans as lower or equal to blacks. This is a huge part of the Gangs of New York historical back ground. The Irish were roundly regarded as a disease for the country than a benefit. This attitude was also contributed to the fact that Irish immigration also brought a huge number of Catholics to a country that was largely Protestant. Even though much of the nation had this racist attitude toward the Irish, it was largely felt in the Five Points, in which Native born Americans and Irish immigrants would clash in bloody street fights for supremacy of turf, resources, and political favors. Did you know that firefighters back in the day were a gang? Because the threat of fire burning New York to ashes was a major concern and since there were no city nor state funded fire departments, many citizens volunteered as firemen and gangs formed around various firehouses and companies. The Plug Uglies got their name by putting a wooden barrel over a fire plug and guarded it so rival fire departments could not use it to put out the fire. Cash rewards were given out by insurance companies to the first fire company on the scene, and the second company on the scene got less. It was not uncommon for rival fire companies to duke it out for the privilege of putting out a fire while a home or building burned down. Gangs such as the Bowery Boys, Broadway Boys, and The 40 Thieves were all real gangs mentioned in the movie Gangs of New York. 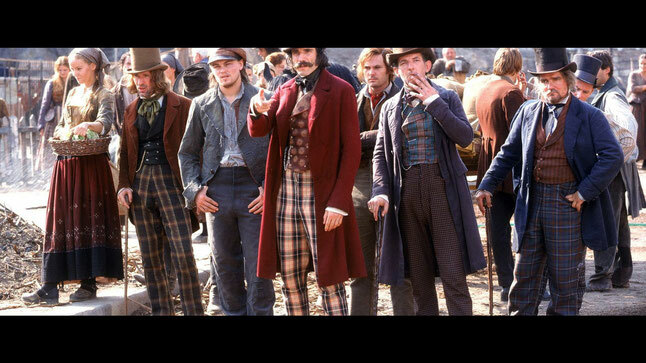 The Gangs of New York movie also used one of the most powerful and prominent Irish gangs in the five points during the 1850s - The Dead Rabbits! There are many tales of how The Dead Rabbits received their name. One tale is possibly of an American journalist at the time misunderstanding of the Irish word ráibéad, meaning "man to be feared". "Dead" was a slang intensifier meaning "very." Since the phonetic sounds were similar, the press dubbed the gang The Dead Rabbits. The Dead Rabbits were originally part of The Roach Guards, an Irish street gang in the Five Points formed during the early 19th century to protect the liquor merchants of the area. The gang would soon begin committing robbery and murder. The Roach Guards were known for their fighting uniforms which had a blue stripe on their pantaloons. When members of The Roach Guard defected to form The Dead Rabbits, they replaced the blue stripe with a red stripe. The two gangs constantly fought each other, but also aligned against gangs like the Bowery Boys and the Natives. The famous Dead Rabbits Riots started on July 4, 1857 when the gang raided and destroyed the headquarters of the Bowery Boys at 26 Bowery. The Bowery Boys retaliated and this led to a large scale riot that waged back and forth on Bayard Street between Bowery and Mulberry street. The very next day, The Bowery Boys and Dead Rabbits rumbled again in front of 40 and 42 Bowery Street. They erected barricades in the street. On July 6, the fighting spread as the Bowery Boys fought the Kerryonians, another gang of Irishmen from County Kerry, at Anthony and Centre Street. Because the police force at the time was disorganized and was ravaged with conflicts between the Municipal and Metropolitan police, the gangs took advantage. Widespread looting and property damage was committed by the gangs from the Five Points as well other parts of the city. Order was restored by the New York State Militia, who were supported by detachments of city police under the behest of Major-General Charles W. Sandford. The aftermath of The Dead Rabbit Riots concluded eight people killed and at least 100 seriously injured. William Poole - The Real "Bill The Butcher"
While the character of Priest Vallon, played by Liam Neeson was fictional and not based off real historical figures, the character of Bill Cutting was. Brilliantly by Daniel Day Lewis, the character of Bill Cutting was directly based off the real historical figure William Poole. The last name may have been changed but William Poole's real nickname "Bill The Butcher" was used in the movie Gangs of New York. William Poole was a Nativist enforcer of The Native American Party, also known as The Know Nothing Party, which was a faction of the American Republican Party. The Know Nothing was a movement created by Nativists whom believed that the overwhelming immigration of German and Irish Catholic immigrants were a threat to republican values and controlled by the Pope in Rome. They were dubbed the Know Nothings by outsiders of their semi-secret organization. This had nothing to do with them knowing anything. It had to do with their reply when asked of the organization's activities, often stating, "I know nothing." The real Bill The Butcher was a leader of The Bowery Boys and known for his skills as being a good bare knuckle boxer. Poole's trade was that of a butcher, and was infuriated when many butchering licenses were being handed out to Irish immigrants. Unlike the movie which Bill "The Butcher" Cutting mentions his father dying fighting against the British, the real William Poole's father did not die fighting the British. In fact, Bill Poole trained in his father's trade and eventually took over the family store. In the 1840s, he worked with the Howard (Red Rover) Volunteer Fire Engine Company #34, Hudson & Christopher Street. Also unlike in the movie, William "The Butcher" Poole was shot in real life. However, he was shot at Stanwix Hall, a bar on Broadway near Prince. William Poole did not die in a glorious street battle against his Irish enemies. Instead, he died from the gun wound at his home on Christopher Street. His last words were: "Goodbye, boys. I die a true American." What was true in the movie was the conflict the real Bill The Butcher had with the Irish immigrant gang the Dead Rabbits. The Dead Rabbits were William Poole's The Bowery Boys most hated enemy, and the leader of the Dead Rabbit's was Bill The Butcher's most hated archenemy. 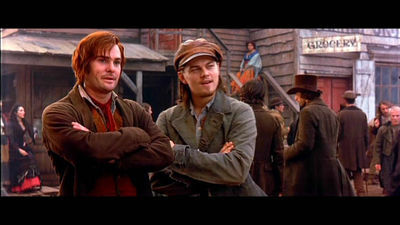 Although the character of Amsterdam Vallon, played by Leonardo DiCaprio, was greatly a work of fiction, it can also be argued that the character of Amsterdam in the movie Gangs of New York was very loosely based on the historical figure of John Morrissey. Unlike the movie, Morrissey's father was not killed by Bill The Butcher and revenge was not his true motif in going head to head with The Butcher. In reality, he became Poole's adversary when he was hired to prevent Poole from seizing ballot boxes and rigging an election. Morrissey and the Dead Rabbit gang were rewarded by Tammany Hall to open a gambling house without police interference. Poole and Morrissey would go toe-to-toe, but not in an epic gang battle. The two fought in a boxing match, in which Morrissey lost. A few weeks later, Lew Baker, a friend of Morrissey, shot and fatally wounded Bill the Butcher at a saloon on Broadway in 1855. Morrissey was a champion boxer, but when he retired, he ran for Congress and was backed by Tammany Hall. He ended up serving two terms (1867-1871) in the House for the 40th and 41st Congress, representing the 5th Congressional District. As a Congressman, Morrissey always looked out for the interests of the Irish. Much like William Poole was an enforcer of The Native American Party, John Morrissey and his Dead Rabbits were often used an enforcers for the Democratic Party and the muscle for the leader of Tammany Hall - William "Boss" Tweed. What would the Gangs of New York historical back ground be without mentioning William Tweed also known as the "Boss" of Tammany Hall, the Democratic Party political machine that played a major political role in New York City during the 19th Century. Within the movie, his character is perhaps the most historically accurate and genuine according to Tweed's historical legacy. Much like the movie, Tweed used Irish gangs like the Dead Rabbits as muscle to rig and combat the rigging of ballots and votes from opposing parties. He was extremely popular with the voters, especially Irish immigrants in which he promised jobs and assistance from the city. Tweed in real life was extremely corrupt and used politics as a pure means to profit. At the height of his power, William "Boss" Tweed was the third-largest landowner in New York City, one of the directors of the Erie Railroad, the Tenth National Bank, and the New-York Printing Company. He was also the proprietor of the Metropolitan Hotel. The New York Times had attacked Tweed constantly of corruption. With the help of cartoonist Thomas Nast, whom drew unflattering pictures of Tweed and his corrupt group of cronies, known as the Tweed Ring, was able to create a negative portrayal of Tweed. After the Orange Riots, support against Tweed grew in large numbers and he was eventually convicted for political corruption. An estimate by an aldermen's committee in 1877, suggested that William Tweed stole around $25 million and $45 million from New York City taxpayers. Jim Morrissey would testify against Tweed in court. The Gangs of New York captured this dissension, and The New York City Draft Riots actually did happen as depicted in the movie. This response to the Emancipation Proclamation started on July 13, 1863. The movie was true about the fact that there was a clause written that allowed persons able to produce $300 dollars to be exempt from serving in the war. This clause actually meant that those who could afford $300 would in essence hire a substitute to take their place in military duty. Any blacks who fell into the grasps of the angry mob were beaten, tortured and killed. One black man was attacked by a crowd of 400 with clubs and paving stones. He was then hanged from a tree and set alight. As the movie depicts and acknowledges, the attack on The Colored Orphan Asylum on Fifth Avenue was historically accurate. A black child died as a result. The police were able to secure enough time for the remaining orphans to escape, but the police were greatly outmatched by the rioters. The state militia was sent to help Union troops in Pennsylvania, and the police were the only force left to subdue the rioters.. The rioting was finally quelled on July 16th. New York's State Militia returned as well as several thousand Federal troops entered the city. The Draft's Riots final confrontation took place on that Thursday evening near Gramercy Park. Although not completely 100% accurate, the real history of Gangs of New York is greatly depicted in this movie. The attitudes that reflected anti-Irish sentiments, dissension about the Civil War among New York citizens, and the attitudes towards the blacks by Nativists and Irish immigrants was thick with historical realism. 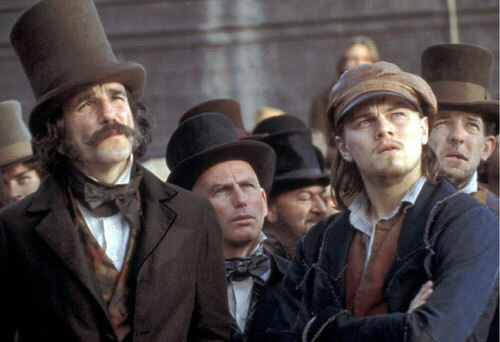 Gangs of New York is a massive achievement and a movie masterpiece that captures one of the worst times in American history - a time that shows us a part of our past. However, like they say, the past is never far behind. Even though we may have not known about these events prior to the movie, these turmoils and attitudes are nothing new and have followed America throughout it's history. Perhaps, even to the present day. The real history of Gangs of New York isn't really that far behind us at all, and maybe or maybe not, this was Scorsese's intention to show us that in this movie.